Saul Bass was Hitchcock's go-to title sequence designer in the 1950s and early 60s. Online journal Smashing Magazine has recently published an article titled "30 Unforgettable Movie Opening Sequences," and my favorite director just made the list -- with three films: Vertigo, North by Northwest and Psycho. 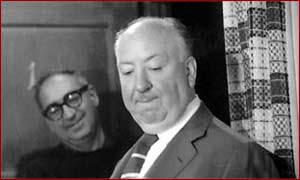 Do the math and you'll see that Alfred Hitchcock's films occupy 10% of the list. Not too shabby, considering he hasn't released a film in 30 years. Of course, it's also no coincidence that mid-century master designer Saul Bass did the title graphics for these films as well. In fact, this blog post should be about Bass: his work -- along with other opening sequences that bear his unmistakable influence -- is all over that list. Which brings me to another point. Is the era of the cool opening credits sequences over? It seems that, back in the day, filmmakers couldn't make a boring credit sequence if they tried. Now, however, unless the movie is a big-budget box office bruiser, you're likely to get just boring old CG typography. What happened to fun openings? While I agree about the current pitiable state of opening sequences/credits (or total lack thereof), I would disagree about the time when there were no boring ones. What about the (sometimes hideous) placard-style openings so common in the 30s and 40s? I wouldn't argue that they were much more compelling than the simple type overlays most often used today. You're probably right. I was engaging in a bit of hyperbole to emphasize my point. Nevertheless, it seems that, in my experience, even the more routine-seeming placard openings had something more going for them than modern titles. For instance, in borrowing their look from theater program cards, they conveyed a sense of theatricality. They made one feel welcome, conveying the sense that a night at the movies was a special occasion. In addition, those placard-style openings often included subtle touches in their borders and margins that referenced themes or situations that would come up later in the film itself. Modern movies, with their CG sans serif fonts are, by comparison, strcitly functional. I think this is ironic: those old title cards were more labor-intensive to produce; meanwhile, even CG titles can be animated and custom-typeset with the click of a mouse. What do you think? I think it all boils down to "creativity." Since the "arts" have been put behind us, and sports in front of us, we seem to be lost without imagination. I'm hooked on all things Hitchcock did, but my first impression, going back a long time ago, was on early PBS in SF, I saw Cocteaus Beauty And The Beast. Anyway, enjoying looking at your past posts also. Thanks to DCD for the link to you. Yep, two of my favorite openings sequences from recent times are the Saul Bass-esque titles from "Catch me If You Can" and the titles from "Naploean Dynamite" that spell out the cast names in mustard and cake frosting and so forth. Beautiful and brilliant and perfect for the film. I was going to mention Catch Me If You Can. I loved it. Charade was also interesting as far as title sequence go. I have to mention the title shot from Rushmore. When the curtain opens and the handmade letters spell out the title as Max stands, arms folded at the side. That shot alone encapsulated the character of Max Fleisher and the feel of the film so well. I'm no Hitchcock expert but fun blog.